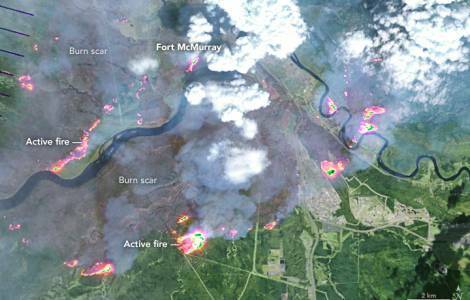 Fort McMurray (Agenzia Fides) - The city of Fort McMurray in northern Alberta (Canada), is completely deserted, abandoned by its inhabitants because of a fire that has destroyed 1,600 buildings. The fire forced the evacuation of over 90,000 people. The numbers of the tragedy are staggering which is now considered the "most expensive natural disaster in Canadian history". Since the fire started, on May 1, it has spread without stopping: the first day it affected an area of about 500 hectares (5 square kilometers) while up to yesterday, May 6 at least 100,000 hectares (1,000 square kilometers) have been affected by the fire. The dramatic situation of Fort McMurray has touched Pope Francis who, saddened by the situation, has asked for prayers for the population. Yesterday, in a letter, the Vatican Secretary of State, His Exc. Mgr. Pietro Parolin, said that "the Holy Father is saddened by the destruction and suffering caused by the fires raging in the Fort McMurray area". "He prays for all the displaced people - especially children - who have lost their homes", reads the letter sent to Fides.